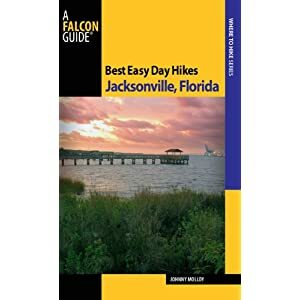 With this book in hand and willing feet you can explore the greater Jacksonville region. No matter where you go, the trails in this book will enhance your outdoor experience and leave you appreciating the natural splendors of the Big Bend. The boardwalk extended beyond the shore over the St. Johns River. I sat on a bench, looking westward across the water, toward downtown. The mighty river, the flowing pulse of Jacksonville with its freshwater tributaries extending inland and tidal tentacles meeting the Atlantic Ocean, flowed past the location of many hikes in this book. My mind soared beyond downtown while mentally recounting all the scenic hikes of greater Jacksonville. Nearby, Jones Creek flowed past wooded trails of the Jacksonville Arboretum. To the east maritime hammock woods, vast shell mounds and river views awaited hikers at Fort Caroline. The protected area of the Talbot Islands contained several trails wandering over ancient wooded dunes, astride tidal creeks bordered by marsh grasses and even along the Atlantic Ocean. To the north, the green oasis of Ralph E. Simmons Memorial State Forest protected woods and paths running beside the St. Mary’s River, a magnificent blackwater stream originating in the Okefenokee Swamp and flowing to the sea, where the trails and history of Fort Clinch State Park awaited hikers. To the south stood the jewel of Castaway Island Preserve, where boardwalks and nature trails explored a slice of coastal Duval County near popular beaches. Beyond that, the protected wildlands at the University of North Florida offered a five-century old bald cypress tree, scenic lakes and a multiplicity of Florida plant and animal communities. To the west, across the St. Johns River, Cary State Forest featured a loop trail that cut into the heart of a swamp hammock, where wetland woodlands regally rose to the sky, encircled by towering pines, with the promise of more trails in the future. The Black Creek Ravines, a conservation project initiated by the St. Johns Water Management District, had paths lacing its sandhills, richly vegetated ravines and down to Black Creek itself. Interpretive information, dark mysterious creeks, and an ever-changing Florida mosaic of eye-appealing scenery were part of the trail experience at vast Jennings State Forest.